Your home should be your sacred space. It is the place that you come back to, time and time again, as your family dances back and forth between school, work, friends, family, errands, and activities. It is the base from which you depart, then return to to unwind, reorganize, (hopefully) play and relax, before you prepare to set out again on life’s adventures. 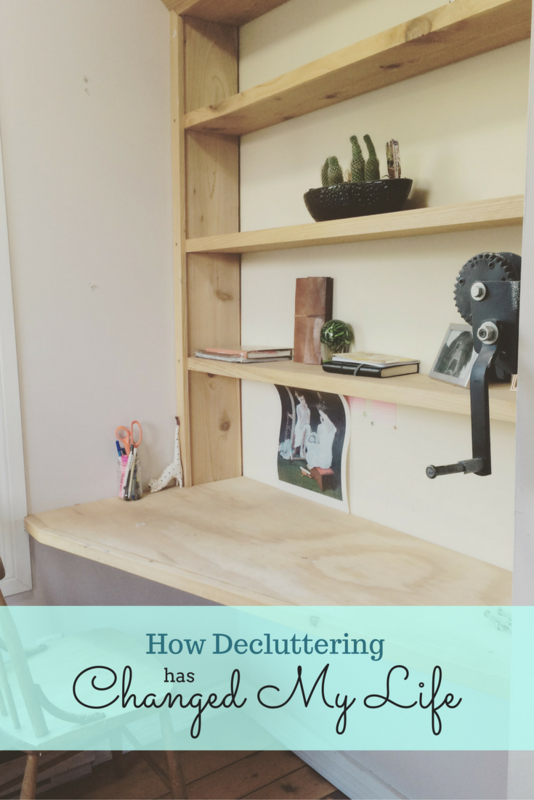 When I realized coming back to my home didn’t feel the way I wanted, decluttering helped me renew that love for my home, and my life. by Marie Kondo could not have appeared and pulled me in to read it at a better time (that’s an Amazon affiliate link, fyi). At the end of last summer, I poured through the pages, gleaning new ways of thinking and being. By the end, I felt that I had the tools and motivations I desperately needed to clean up my act, and to simplify my life. Now that it has been over a year since starting my own Konmari journey of decluttering, I feel I’ve come a long way from the mess I was before. Don’t get me wrong, my house is still messy. I still have too much, and I’m still searching to find the ways in which I can feel more organized in my home and my mind. However, even though I still have some categories of belongings to complete decluttering (and did not complete the challenge within the suggested 6-month time frame) there are many ways in which I can see and feel the benefits of embarking on this project. In order to help me better see the changes and motivate myself to continue on (and perhaps help to motivate others to start their own journeys), I wanted to take a few minutes to share the benefits I’ve noticed. Reading The Life-Changing Magic of Tidying Up helped me make the mental shift towards realizing that not all of the things I hold on to are necessary in my life. This motivated me to remove all the excess, in order to experience the peace that comes with owning, keeping track of, and seeing fewer things filling every corner of our home. Going through each collection of items made me realize the extent of the excess cluttering my life. Honestly, who needs this much sea glass and shells? Decluttering all this (and more) left me with a beautiful loose parts collection for Z to explore. Open, clear, uncluttered space is beautiful! Having less makes it so much easier to keep everything where it goes, and to notice when something is out of place. (Although, with a toddler around, it’s not exactly the epitome of tidy that I dream of one day experiencing.) Having less also helps us to see when something is not being used, and perhaps is no longer needed. We have more physical space and mental clarity to really make use of what we do want in our lives, and to remove all the excess. The first step in the Konmari method of decluttering is to clearly and specificaly visualize how you want your life to be. What do you want to spend your time doing? What kind of hobbies and activities do you want to participate in? From here, you can see what kind of decor and possessions will aid the kind of life you want to lead, and which do not fit into your desires. If you don’t yet know what it is that makes you happy and how you want your life to be, you can’t really go about making that life, can you? Focusing on what I need or not in my life helped clear the excess to fully realize our goal of a new, functional kitchen. It has been an amazing change in our lives. My wardrobe and accessories have been greatly reduced, allowing me to form a more concrete understanding of my own style preferences. By setting aside distractions and looking at each item on it’s own, I was able to see those patterns of preference. Now, when I’m shopping or offering suggestions to others about what I might like, it seems much simpler to come home with items that truly spark joy in me. This is much preferred to coming home over and over again with items that looked great on the rack, but don’t really suit myself and my own unique style. Hooray for saving time, saving money, and never having to wear something you don’t feel amazing in! Kitchen wares had been one of my major weaknesses in accumulating more than I need, just because I could. No more! There are two types of items that I have always had the most difficulty parting with. Things that have been given to me as gifts, and mementos that remind me of times and people who are very special to me. Again, reading The Life-Changing Magic of Tidying Up helped to retrain my brain in consideration of these items. Finally, I feel more able to let go of, not only the possessions, but of certain feelings and thoughts that surround these sentimental items. This is just a very small portion of what I have decluttered and removed from my home over the past year. So freeing! For a more detailed look at how The Life-Changing Magic of Tidying Up (affiliate link again) has helped me learn to let go of gifts and sentimental items, stay tuned. I plan to publish it in the next week, and when I do I will link it here. If you liked what you read, why not sign up for my short and sweet weekly e-notification of what’s new on the blog. (This way you won’t miss the next post on letting go, either.) Click here to add your name to my email list. Disclosure: I have included Amazon affiliate links within this post, to the book this was all about. If you purchase anything through these links, I will receive a small commission (not paid for by you), which helps to keep this blog up and running. You can view my full disclosure statement here. I loathe clutter, but I’ve always kept a couple of rubbermade containers full of stuff in my parents’ barn loft. I’m glad I didn’t allow the stuff to clutter my day to day life, but it has been a treasure trove of memories and a lot of fun to dig through a couple of times a year with my daughter. Most recently my sister and I bought my Dad a turntable for Father’s Day, and I was able to pull out my small collection of children’s records that I’ve had since I was 4, and share them with V.